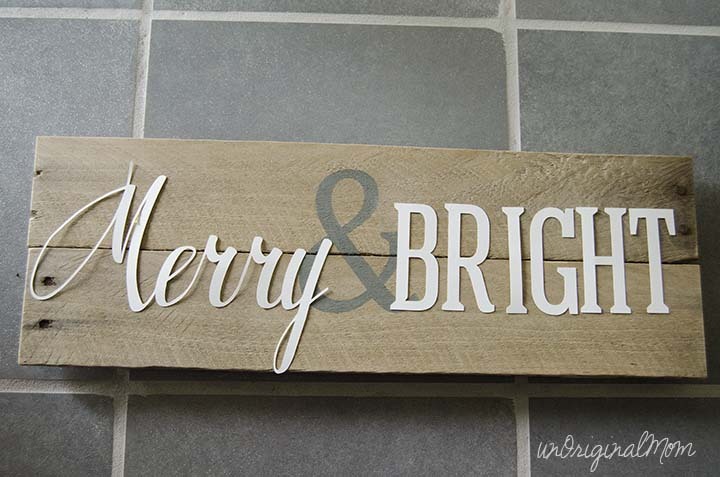 Rustic wooden signs have been around the Pinterest world for quite a while now, and it doesn’t seem like they’re going away anytime soon. There is just something so classic and versatile about them – they fit with so many decor styles and seasons! 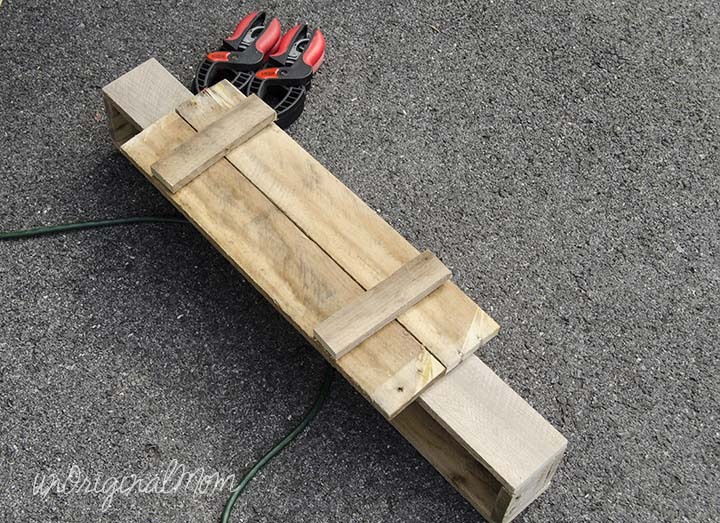 So when we were working on another pallet project, I had my hubby take a few extra pallet boards and glue them together to make a pallet wood sign, knowing I would certainly find something to do with it. 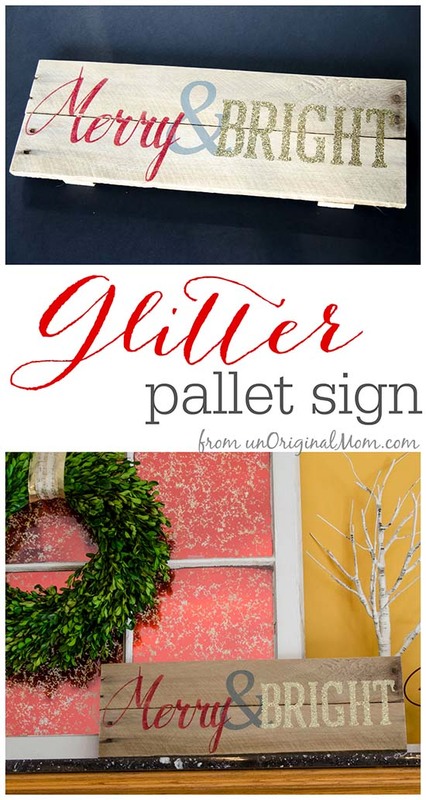 I think that sucker sat in our garage for less than a week before I snatched it up to make this #rusticglam glitter pallet sign. 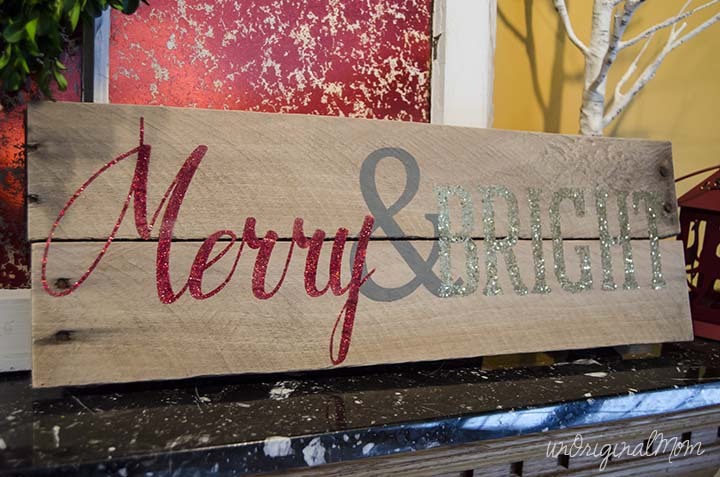 I absolutely love the contrast of the glitter with the rustic wood, don’t you? 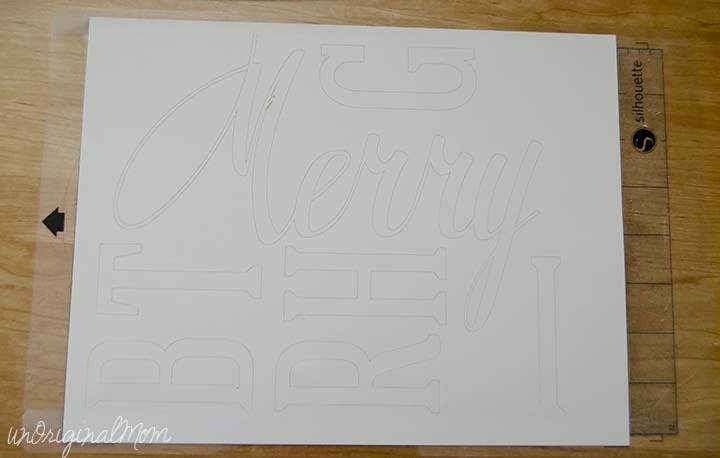 I used Silhouette brand double-sided adhesive to make the glitter letters, and it’s so easy! I designed and cut the letters with my Silhouette, then covered them with glitter. I think the whole thing took less than 30 minutes to design, cut, and glitterify. 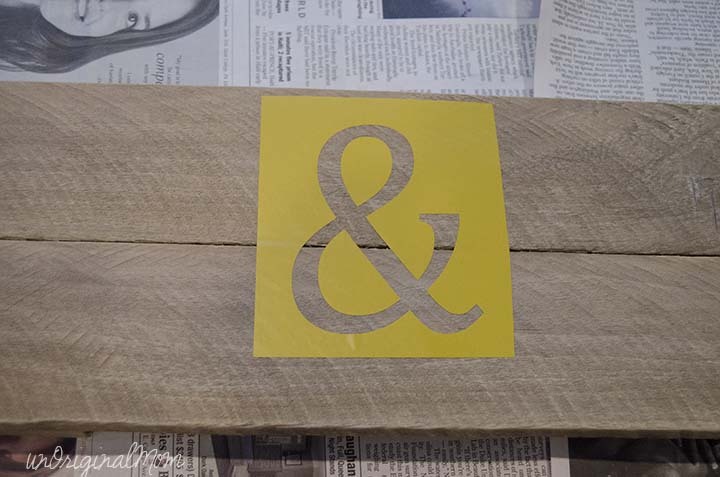 But first, I used a vinyl stencil to paint the ampersand gray first. That allowed me layer the double-sided adhesive slightly on top of it on either side. 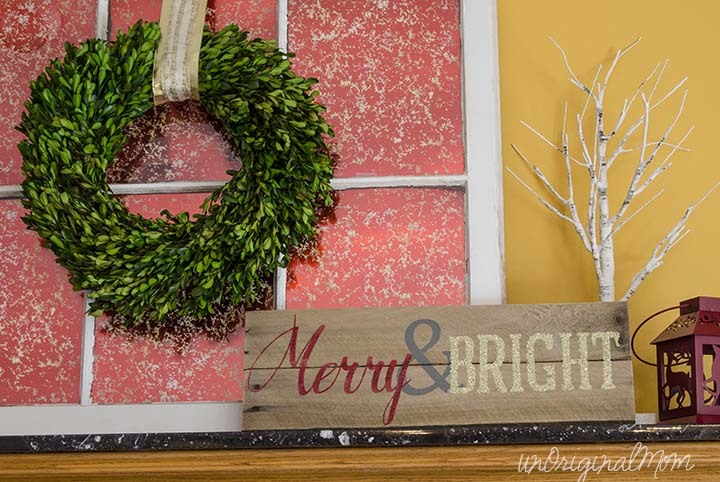 The trick when you’re doing two different colors of glitter is to only peel off the white paper on one word at a time – first I put the chunky gold glitter on the word “bright,” then once that was completely covered I peeled off the paper on “merry” to apply the fine red glitter. Silhouette’s double-sided adhesive is such a great way to add perfect glitter lettering or shapes to any project – cards, signs, gift tags, and more! 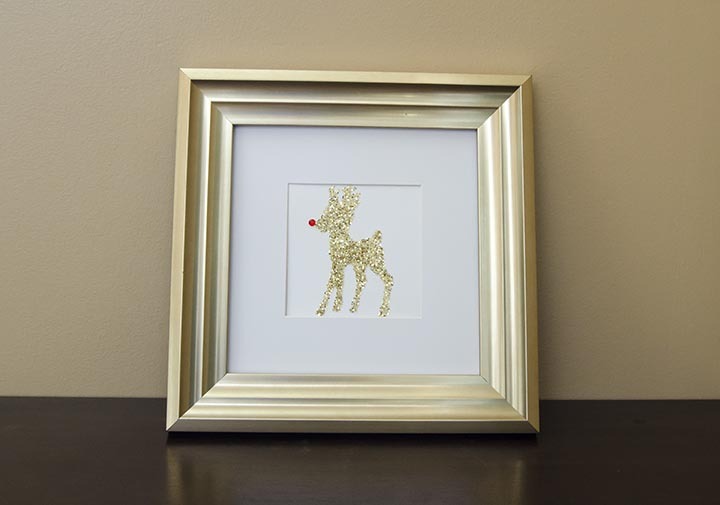 I used it to create this glitter Rudolph for our foyer, too, and I love how it turned out. The adhesive gives you really crisp, clear lines…and if you use a stiff paintbrush to brush off the excess glitter, it won’t even “shed” on you either! Here’s a more detailed, step-by-step tutorial on how to use the adhesive to apply glitter to any surface – I used it to put a monogram on a faux pumpkin! One of the things I love about the Silhouette is how easy it is to create typography art using fonts you have installed to your computer. It only took me about 5 minutes to create this design! I really like the Ultimate Cameo and Portrait Package. I would like the Holiday Starter Kit. I would like the Holiday Starter Kit, so I can see what it can do….always like to fool around on a machine to what it can actually do before I actually use it for a project….. If I had to choose one bundle, it would be The “CAMEO and Designer Edition Super Bundle”. This one seems to come with all of the essentials to get you started. I want to try the Advent Calendar shadow box! I would love the Holiday Starter Kit!! I would love the Holiday Starter Kit! This is gorgeous, Meredith! I love it! I love the ultimate bundle, because I’m a brand new crafter and so I need to get myself the whole shebang! I would go with the Club silhouette package, although they are all wonderful deals! I would love the Cameo, Designer Edition, and Club Silhouette Package. Would love to have this for the holidays! The CAMEO and Designer Edition Super Bundle is at the top of my wish list! I like the Holiday Starter Kit! I would choose the cameo and designer edition super bundle. I’ve wanted one of these for a long time and your project makes me want one even more! So cute! I would love to win the Cameo, Designer Edition, and Club Silhouette Package. It would be so awesome to be able to use all of the crafts going on in my head! I would love a portrait or a cameo, or any of the bundles. You can do SO much with these machines. I’ve never used one before but love all the projects and crafts I’ve seen, I like the holiday starter kit too! The ultimate cameo package deal would be nice. Thanks for the giveaway….the cameo & club bundle! I could really use the holiday started kit!! I like the CAMEO and Designer Edition Super Bundle. I love the Ultimate CAMEO and Portrait Package! I love Portrait Silhouette, its beautiful and Advent Calendar Shadow Box *-* its beautiful!! No glitter but I like rustic glam. ADHESIVE VINYL is cool for the wishlist. CAMEO and Designer Edition Super Bundle is what I would most like to have. Holy moly I honestly would settle for any of those bundles but the Cameo plus Designer Edition plus Club Silhouette package would be amazing! Of course I want it all! I would love to have the CAMEO and Designer Edition Super Bundle!! Ohhh Silhoutte Cameo and Portrait Package! I’ve just rolled out my pandora’s box for Christmas and I can’t wait to use these for my vintage theme. 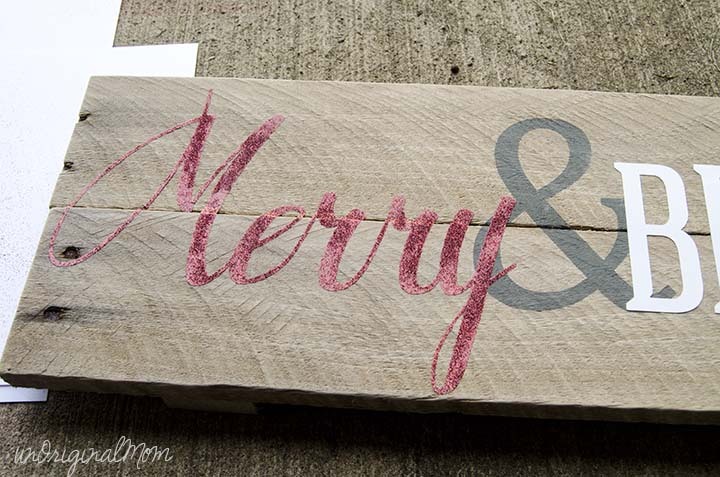 That glitter on the rustic wood was really gorgeous Meredith! It’d definitely be in our backyard living room. I have the Ultimate CAMEO and Portrait Package on my wish list. Ultimate Cameo and Portrait Package would be my ult pick! I like the Ultimate CAMEO and Portrait Package the best, I think. CAMEO and Designer Edition Super Bundle! I would love the Cameo and Portrait bundle! I’d love the CAMEO and Designer Edition Super Bundle. The Ultimate CAMEO and Portrait Package looks amazing! I’d love to have the cameo/designer edition bundle! Thanks for the chance to win! CAMEO, Designer Edition, and Club Silhouette Package would be the one I grabbed up! I love all the crafting that can be done with these! Plus a year subscription to the Silhouette Club is just awesome! I would love the Cameo DE and Club Silhouette package!!! I would get the Cameo and Portrait bundle. One for me, one for my mom. id love to have the CAMEO and Designer Edition Super Bundle. wanted one of these for so long. would help with signs i make for a booth i have at a antique mall and other projects that i want to do. I am wanting to add some rhinestone items to my craft stuff! The Holiday Starter Kit looks fun. This is such a beautiful sign, thanks for sharing! I would love any of the bundles so so much! But, if I have to choose one…I would love any bundle that includes the amazing Cameo machine! I’m obsessed with the Portrait and will probably buy the Portrait Holiday Steal if I don’t win…oh, and a bunch of accessories! That holiday starter package looks awesome! thanks for hosting this! Ahh the Cameo/Portrait bundle would be a dream! This is an awesome giveaway and the project is unbelievable!! Seems like it would be perfect for a beginner holiday project. I would love the cameo and portrait bundle, that would be a dream! 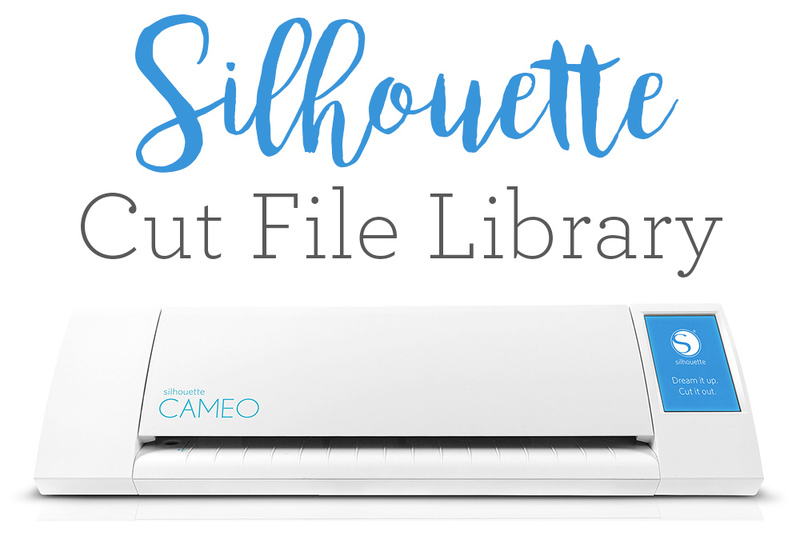 I would love the CAMEO and Designer Edition Super Bundle but at this point I’d be thrilled with any Silhouette product! I would love one of the cameo bundles! I would get the Cameo and Designer Edition super bundle. I’m so DYING for a Silhouette! We’re on a grad school budget so this is way out for me but if I can win it, I’d be the happiest mommy!!! Thanks! If I was choosing a bundle it would be the Cameo, Designer Edition, and Club Silhouette Package. Entering to hopefully win for the wifey’s craft room. This is an awesome giveaway! I think the CAMEO, Designer Edition, and Club Silhouette Package is a great package. Thanks for hosting this awesome giveaway! I would get the Portrait bundle for $119. I would love to have the portrait bundle. I use glitter all the time, I teach kindergarten. I do it the hard way, with glue, so I find glitter everywhere. All. The. Time. I would enjoy the Portrait bundle – but would follow Unoriginal Mom’s recommendations. The Club Silhouette bundle looks great! I’d love the cameo bundle! I’d love the portrait bundle. Not sure which is right for me but the CAMEO and Designer Edition Super Bundle sounds like a good option. I would love the portrait designer edition bundle:) thx so much for hosting a giveaway and awesome tutorials! the ultimate portrait & cameo bundle!!! I would like to have the CAMEO, Designer Edition, and Club Silhouette Package. 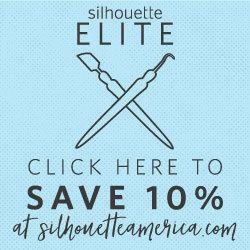 I love that it includes free Silhouette products throughout the year. I would love the cameo bundle! I just ordered a Portrait the other day before finding your blog! It would be great to win another one though, that way my daughter won’t have to keep asking to borrow mine! Thanks for offering to a chance to win. I’m very curious about their stamp making kit! I would love the Cameo bundle and the holiday starter kit!! Would love the Holiday Starter Kit….. I want one of these so bad. I’m keeping my fingers crossed!!! Have just followed the steps and done up a similar sign. Nice and neat. Well done and thanks! !